Night Engine, fresh their performances at The Great Escape, recently announced a run of three shows in London in August. The band will play consecutive Wednesdays (7th / 14th / 21st August) at the St. Moritz club in Soho. The band have also confirmed an NME/Radio 1 stage slot at Reading & Leeds festival, a decent feat after just two singles. From their first public appearance following the reaction to the posting of early track, ‘I’ll Make It Worth Your While’, on Soundcloud at the close of 2012, Night Engine described their sound as ‘the music of the city’. They talked of the lure of the heart of London’s historic clubland to four boys from the capital’s outer edges so the shows are, in some ways, a homecoming. Given that all their London headline shows, including the recent XOYO date, have sold out in advance, it’s fair to say that these shows will likely sell out too. 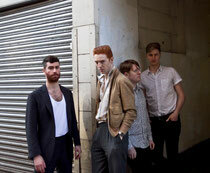 In addition to their Soho nights, the band will play selected festivals across the summer. Go seek them out!